View of project looking Southwest. Renditions shows May 28 version (left) and current version (right). View of the development approaching from the east. Renditions show May 28 version (left) and current version (right). 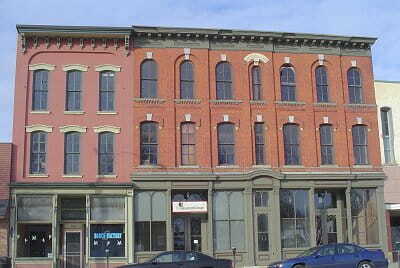 Foot print of first floor showing available retail space. Left to right: Robin Bettarel, Director of Development, CAS Riegler; Kevin Riegler, Partner, CAS Riegler; Kevin Sperry, Antunovich Associates Architects; Daniel Chao, ANC6B07. 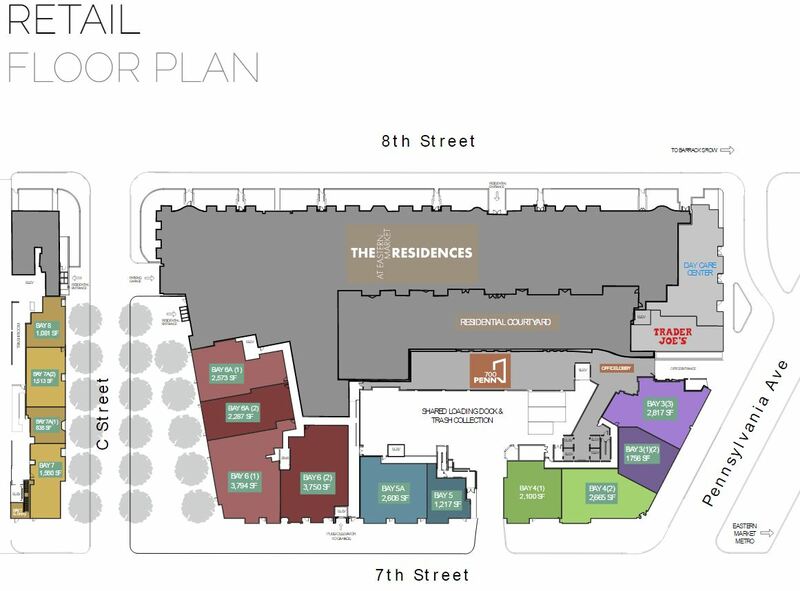 Tuesday night ANC6B voted to support the major retail/residential project at 1401 Pennsylvania Avenue, SE, and the package of benefits and amenities to compensate the community for allowing greater height and density than city regulations would otherwise allow. The vote was unanimous, 8 – 0; the endorsement goes to the Zoning Commission where it will be taken into account while considering the developer’s request for zoning changes to accommodate the proposed size of the project. 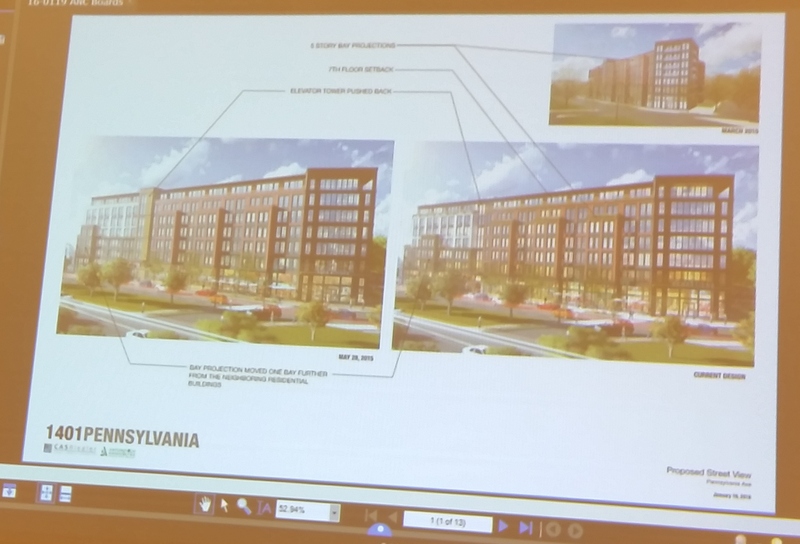 The developer, CAS Riegler, said the mixed retail/apartment project is a retail project at heart, with 19,000 square feet “Class A” retail, 58 parking spaces, and 174 residential units. 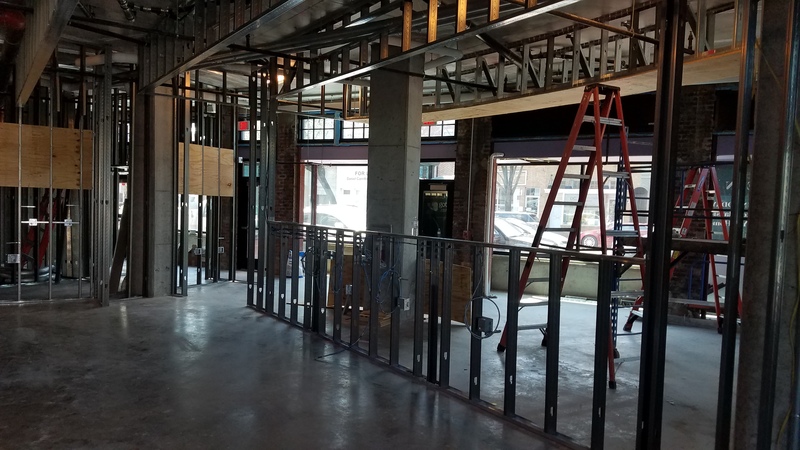 The defining feature of “Class A” appears to by 18 foot ceilings in the retail space on the first floor. Above, there will be six levels of residential with a masonry and glass façade. 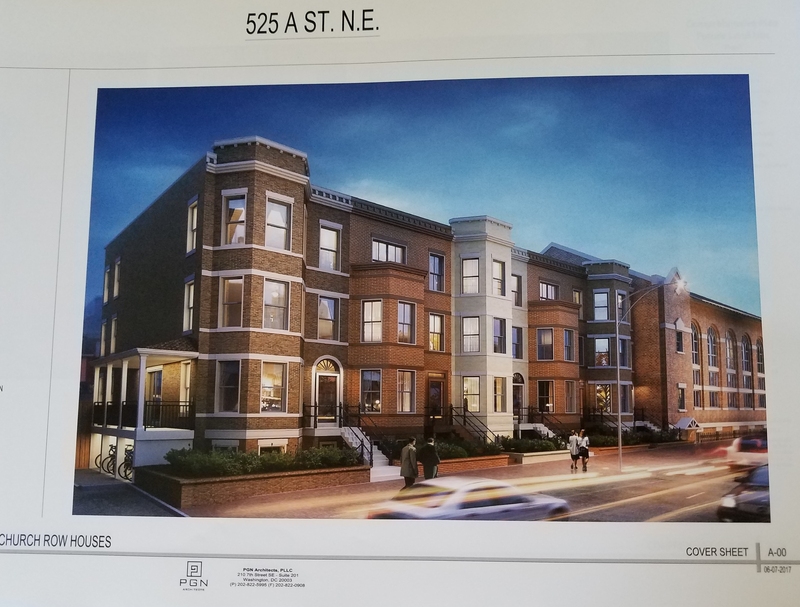 ANC6B Commissioner Nick Burger’s Planned Unit Development (PUD) Subcommittee has met with residents over the past few months to solicit ideas for a package of benefits and amenities to present to the developer. CAS Riegler responded with a list of projects the developer was willing to proffer to the community. The ANC considers, amends, and subsequently agrees to or rejects the package on behalf of the community. Potomac Metro Plaza improvements including enhanced greenspace and improved safety. Value: $50,000. Improvements to the playground at Friendship Chamberlain Elementary with the provision that the school will allow public access to the playground during non-school hours. Value: $75,000. Improvement to the playground at Hopkins Apartments with the provision that Hopkins will allow public access to the playground during daylight hours. Value: $20,000. Tree canopy improvement in Ward Six. Value: $5,000. Enhanced and improved alley system behind the development between 14th Street and Ives Place, SE. Value: $65,000. At the insistence of ANC commissioner Daniel Chao, the developer agreed to contribute an additional $20,000 toward several projects requested by the residents of Potomac Gardens, including modification of the fence around the site, better security cameras, and increased access to Wi Fi. 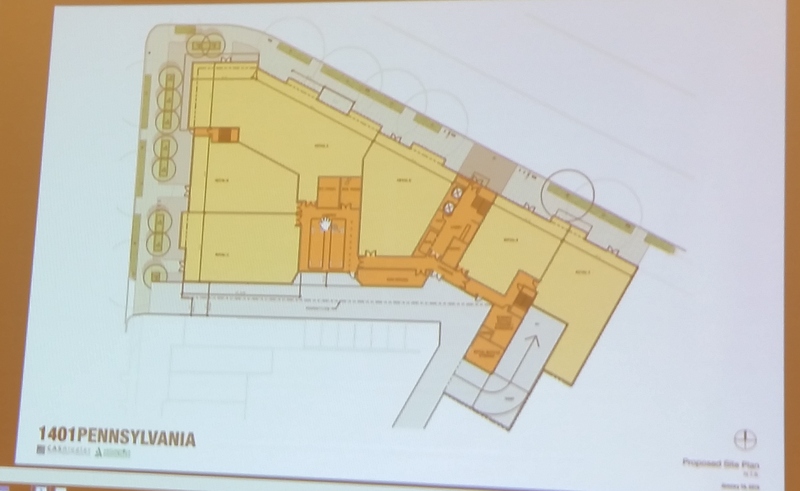 PUD Subcommittee Chair Nick Burger pledged to seek additional funding for Potomac Gardens from two other developers – Insight Development and OPaL, LLC, which are undertaking Planned Unit Developments near the Southeast Safeway. Before the vote on supporting the project and the benefits package, former commissioner Ken Jarboe – who participated in the discussion as a resident member of the Planning and Zoning Committee – questioned whether the community was receiving enough in exchange for the greater height and density being requested by the developer. Jarboe said that the developer was asking for a building 78 high instead of the 50 feet permitted by right and doubling the density for the site. In return, he said, the community was getting a lot of Class A retail, 4 three bedroom affordable apartments, and some $300,000 to spread around on various projects. Jarboe said that he personally thought the building was one floor too high. Commissioner Nick Burger appeared to represent the consensus of the commission when he pointed out that two benefits which were not in the agreement were the transformation of a pizza outlet and a vacant lot into an asset for the community and cited the need to add more housing in a city with a housing crunch as justification for the height. He said he was sensitive to the impact of the building on the neighborhood and urged the developer to take additional measures to change the perception of the height of the building. He added that he agreed that “at some point we have to consider how much building development we want.” But tonight was not the night when that question would be raised. CAS Riegler recently developed the former Edmonds School in northeast Capitol Hill into condo units ranging from 500 square foot one bedroom apartments to 1700 square foot lofted three bedroom units. CAS Riegler’s intention to develop the Pennsylvania Avenue project was first reported by Capitol Hill Corner last January: See here: http://bit.ly/1V7kul0. A subsequent report was posted here: http://bit.ly/1n8MJF2. Damn, that’s a hell of a shakedown on the developer. They are paying for so much that the city should be doing anyway. You say it is “a hell of a shakedown on the developer” in your first sentence, RPFC Man says “Total shakedown of a developer” in his. Your second sentence (“They are paying for so much that the city should be doing anyway.”) is almost identical to RPFC Man’s second sentence (“They are a lot of things that the city should be doing anyway.”). And you both are studiously ignoring the fact that the developer could have gone back to what they could do as a right (50 feet), if they didn’t like the result of the negotiations. So no shakedown. Total shakedown of a developer. Why should they be forced to do any of those things? They are a lot of things that the city should be doing anyway. They city is too busy insisting upon $15 minimum wage and mandatory paid leave, thus ensuring that the new Class A retail space remains empty. When the retail space isn’t leased, the Mayor will stomp around in a “blood mad” fit of rage so as to distract from the City’s policy mistakes. How can it be a shakedown, if the developer gets 28 extra feet of height, doubling site density, with many more units that they could have built by right, in a voluntary negotiation? The developer got more than he gave up, why else would they have agreed? They could always have gone back to doing what they could do by right, build up to just 50 feet. Whether the balance is right for the community, I can’t say, but if the developer is happy with what they had to give, to get the extra 28 feet in height, there cannot be a shakedown. This is the problem with development in D.C. The city requires these units, but allows developers to pass the cost on to other renters. The City, not the other occupants, should be helping offset these subsidies with tax or other financial incentives. The cost of renting is already too high for low & middles class individuals and families. We’re getting priced out of the city by “luxury” apartment developments where this is allowed to happen. They broke the rules for height at Hine and before the ink was dry, they now are allowing another building on Pennsylvania Avenue to exceed the height limitations that make DC distinctive. And they don’t do it by just a little bit–78 feet versus 50 feet–a 25% increase in height. How high do you think the replacement for Frager’s will be? How long before the townhouses on south Metro Square at Eastern Market are torn down and replaced by over-height buildings? How about on the 1300 block of Pa Ave? The developers come in, build whatever they like, take their money and are never seen again, and the neighbors are left with the result. Commissioner Oldenburg apparently has never seen a development she doesn’t like and Jarboe stands there wringing his hands. If there is any time to fight this, it now, on this building, before the cascading effect can take place. You are aware this is a suburban-style fast food restaurant that is being replaced, right? Does that somehow adds to the distinctive character of the neighborhood? is the developer REALLY paying for these amenities anyway? 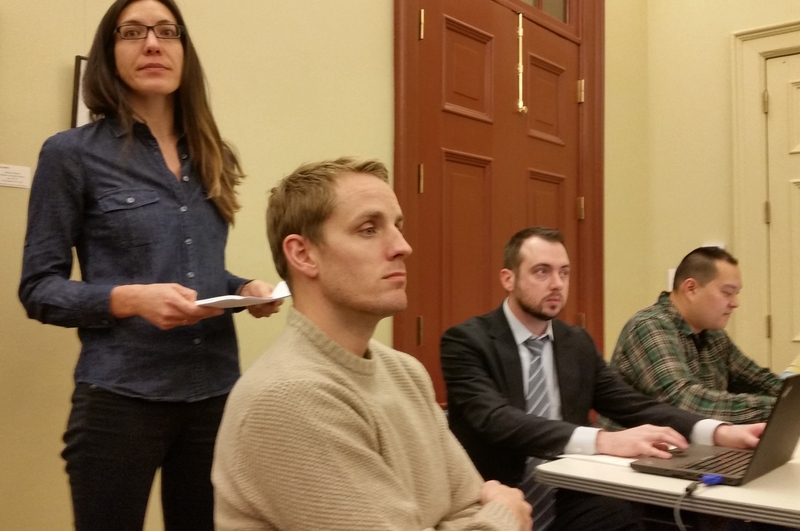 with Hine, the city reimbursed the developer. besides, any costs to the developer are made up in other ways. It was refreshing to go to a meeting where the main sticking points were community benefit and construction management agreements. Those really are trivial matters. No sitting commissioner opposed the height, rezoning, or density. I take that as a huge positive step in general and specifically for the Watkins Alley and Bowie’s/Signature projects. Good point. Who needs natural light anyway? Sounds good to me. More density and development near transit is a universal win. The neighbors are left with…what exactly? More neighbors and newer housing stock. What’s not to like? Overall, I am delighted to have it and am eager to see what happens in the 1300 block (it has to happen eventually though I wonder if all the other development is holding that possibility back for now). In terms of Frager’s, I wish Capitol Hill Corner would do some investigative work on the stability of the structure (I keep hearing about how contractors are afraid to work on it b/c it is unsafe) and the role that the HPRB and the CHRS are playing in keeping it from being redeveloped. Mark, Frager’s is in the Historic District. That is why CHRS and HPRB would have a role. I very much doubt either entity is preventing redevelopment of the Frager’s building. They might be asking that the developer follow the legal requirements? That is a big difference. I don’t have a problem with somewhat higher elevations near Metro stops, you do want density near such stops. So I don’t have a problem with the 1401 Pennsylvania Avenue development. But I also don’t think that developments that high should occur within the Capitol Hill Historic District simply because they occurred several blocks away, where the historic building and neighborhood values aren’t as prevalent. This appears to be a good compromise. The NY Pizza site is across the street from Potomac Metro and on PA Ave SE – it should be a large, dense development. But from that point, the developer has worked closely with us to address almost all of our concerns and deserves the ANC’s support. 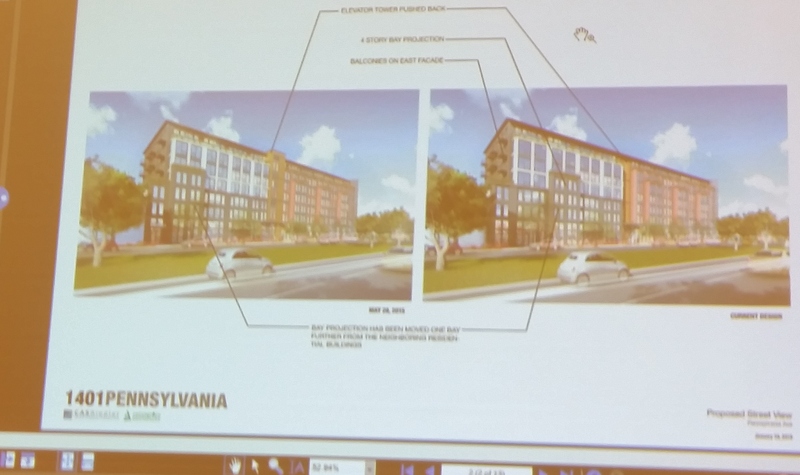 I find the community benefits to be lacking/misleading and wish the building were taller on PA Ave and shorter on the sides, but that’s for the ZC to handle and not the ANC. But I *LOVE* their New York Combonisha! I’m on the 1400 block of Penn, literally across the street from where this project will be, and I’m happy with it. There has been a NY pizza and an empty lot as long as I’ve been around. Well, this just clarified for me that it’s time to vote Nick Burger out. It’s okay to break the zoning rules here but not for the tree house. Who exactly does he think he represents? Not me (and yes, I do live within the district he purports to represent).